When about 20 years old he abandoned his surname and since the mid 1950s when the 'd' was omitted from his name in an exhibition catalogue he has been known simply as Arman. In 1949 he moved to Paris where he studied archeology and oriental art but began painting. He travelled extensively and served in the French Indo-China war. In the early 1950s he became influenced by Serge Poliakoff and Nicholas de Stael, both abstract painters and later met with American artist such as Larry Rivers, Rauschemberg and Jasper Johns. 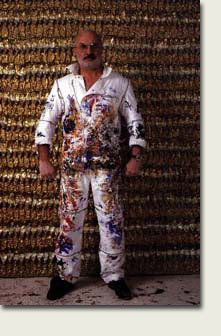 He began making sculptures and exhibited very abstract works in Paris. In 1957 he gained interest in common objects as works of art. His first works after this point were objects dipped into paint and then pressed into canvases. In doing so, the objects' shadows or impressions were left behind. He called these object impressions, or allures d'objets. Arman then figured that the objects themselves were of some importance, and began to treat them in a special way. He started piling objects in 1959, in view of criticizing art and the consummer society.After meeting Marcel Duchamp in New York in 1961 he started making his accumulations, abstract reconstructions of broken up objects such as paint tubes and musical instruments.Monumental work include the piling up of a tower of 80 tanks in Beyrouth. His intention is to remove the material function of an object so that as a work of art its only possible function is to feed the mind, and to no longer serve a material purpose. He accomplished this by breaking, slicing, or even burning objects such as: a violin, a telephone, a typewriter, and even a whole car! In creating works of art, he also renders objects useless by accumulating them. For example, one of Arman's pieces is comprised of two-thousand wrist watches in a plexiglass box, which is fun to look at but non-functional. Arman has discovered that once one becomes emotionally detached from the circumstances associated with an object, such as a broken violin, one can grow to appreciate the object's abstract beauty. In a sense, Arman is conveying the idea that things one may never regard as attractive may indeed have a great deal of aesthetic value. Because of Arman's achievement, he has come to realize full, worldwide recognition. Each year for the past eight years, Arman has figured among the top fifteen artists in the list of the Top 100 artists of world-renown. Some of his original works are selling for as much as $500,000, and his prints and posters have been used to promote international music festivals, such as one held in Luxembourg in 1978. Arman's one-man shows have taken place in major museums all over the world. He and his work have also been featured in many television interviews, and innumerable articles. His one-man shows have adorned the world's most prestigious art galleries. Armand Pierre Fernandez born in Nice to Antonio Francisco Fernandez and Marie Marguerite Jacquet Fernandez. His father, from North Africa, owns an Antique shop. Attends the Cours Poisat School for Girls because his father does not want to separate him from his best friend, Micheline, a girl. Remains in the school until 1940. Plays chess for the first time, devotes himself to improving his skill by studying books on the game. This passionate dedication to a subject is to characterize him throughout his life. Learns oil painting from his father, a Sunday painter. Enters the Lycée de Nice; is expelled three months later. Attends boarding schools in Grasse and Vence before returning to the Lycée de Nice. Receives Baccalaureate in Philosophy and Mathematics from the Academy of France and attends Cours de Vienne. Enters the Ecole National d'Art Décoratif de Nice. Leaves in 1949 in protest against the social conservatism of the school administration. Develops interest in collecting antiques, in particular Chinese Porcelain while buying at auction for local dealers. Meets Yves Klein and Claude Pascal at a judo school in Nice. This year and in 1948 the three friends hitchhike through Europe. In admiration of Vincent Van Gogh, who signed only his first name on his paintings, they decide to give up their surnames. Until 1953 the three are strongly involved, spiritually and intellectually, with Zen Buddhism, Rosicrucianism, Gurdjieff, and Astrology. the École du Louvre in order to become an auctioneer. Begins painting in a Surrealist style. Leaves the Ecole du Louvre and goes to Madrid with Yves Klein to teach at the Bushido-Kai Judo school. Klein leaves for Japan at the end of the year, returning to France in 1953. Serves in the Medical corps of the French marines during the Indochina War. Returns to Nice. Influenced by the Russian immigrant painter Serge Poliakoff and Nicolas de Stael, begins working abstractly. Collaborates with Klein on happenings. Marries Eliane Radigue (separated 1967; divorce 1971). They have three children, Françoise, Anne and Yves. Continues to collect antiques and decorative objects. Develops interest in African art after viewing an exhibition in Paris. Sees Kurt Schwitters exhibition at Galerie Berggruen in Paris. Begins experimenting with rubber stamps. Sees his first Pollock paintings at Studio Fachetti in Paris. Creates the firstCachets. Works in Nice, scuba fishing and selling furniture, cars and appliances. First solo exhibition of Cachets and paintings held at the Galerie du Haut-Pavé, Paris. proto- Sumerian cuneiform languages with the French archaeological mission. The printer of the catalogue for a group show at Galerie Iris Clert, Paris, omits the "d" from his name. At first outraged by the error, he decides he prefers to be known as Arman. Creates the first Allures d'Objets. Makes his first sculptures: destruction, Poubelles, Accumulations. First solo exhibition held in Italy at the Galerie Apollonaire, Milan. Fills Galerie Iris Clert with garbage, creating Le Plein ("Full Up"). Signs a manifesto with artists of the Nouveau Realisme and Critic/Art Historian Pierre Restany. Meets Larry Rivers, Robert Rauschenberg, and Jasper Johns in Paris. Has his first lessons in English from Rauschenberg. Smashes furniture at Abbaye de Roseland, Nice, creating Colère de Meubles Henri II. Accumulates objects in polyester. Makes first visit to New York and is included in his first museum group exhibition, The Art of Assemblage at the Museum of Modern Art. Simultaneously his first solo exhibition in the United States opens at Cordier- Warren Gallery, New York. Lives for several months at the Chelsea Hotel, as he will continue to do for a part of each year until 1968. Meets Marcel Duchamp at a dinner given by artist and collector William Copley.